Emcee Sean Gambrell, right, introduces the Americana duo Ann and Elizabeth in the upper loft at 58 Main Street in Bangor Monday. 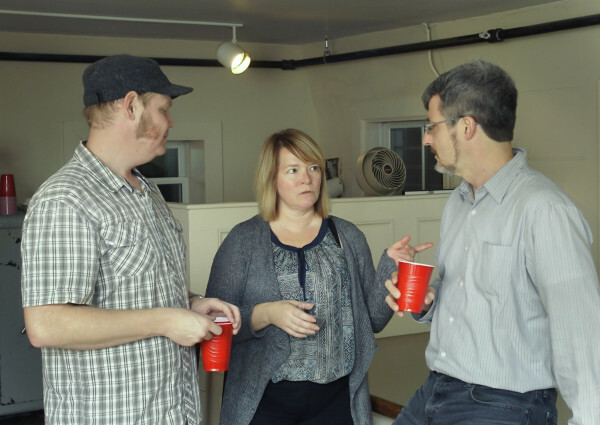 Emcee Sean Gambrell, left, and an owner of the venue Amy Blackstone and patron Michael Wittmann, right, before the evening performance in the upper loft at 58 Main Street in Bangor Monday. 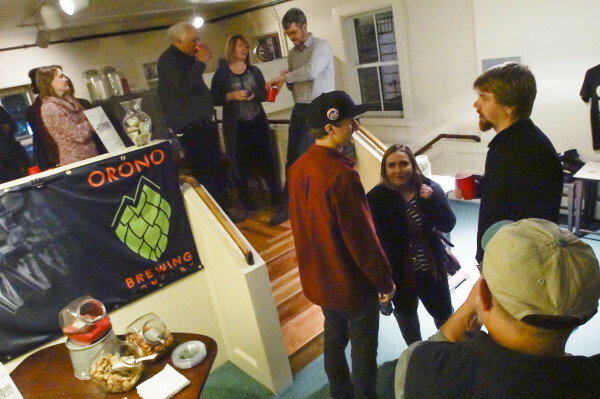 Patrons gather to mix and mingle before the evening performance in the upper loft at 58 Main Street in Bangor Monday. 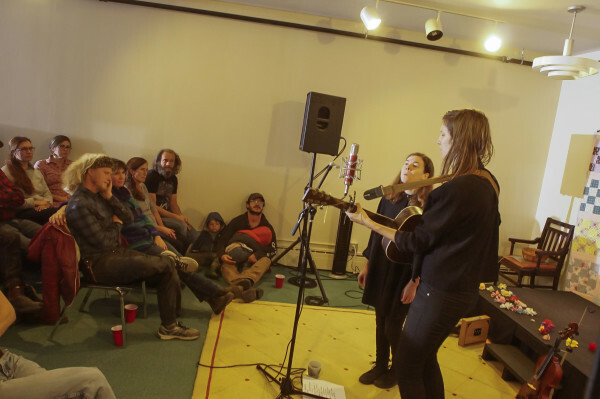 Americana duo Ann and Elizabeth perform for a packed house in the upper loft at 58 Main Street in Bangor on Monday. After nearly 10 years of hosting house concerts at 430 Bayside Road, his home in the southern end of Ellsworth, Steve Peer has scaled back on the number of concerts he holds each year. There’s a lot more competition now. 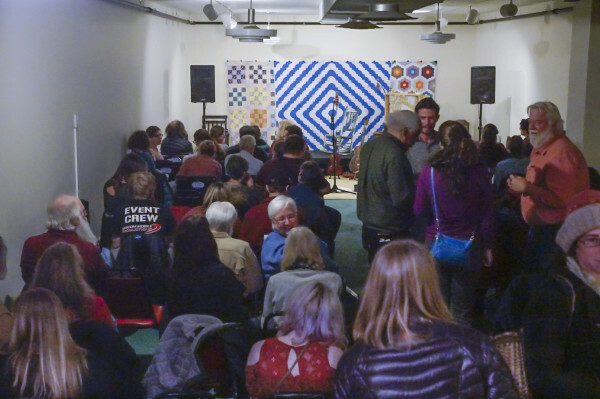 In the past few years in eastern Maine, the phenomenon of regular folks hosting musicians and other performing artists in their own homes, barns or garages has swelled — from invite-only backyard shows, to semi-public performances in otherwise empty spaces, such as the concerts at 58 Main St. in downtown Bangor. Why the renewed interest in this intimate, homegrown means of hearing live music? Sean Gambrel, who books shows for 58 Main St., thinks there are several reasons. 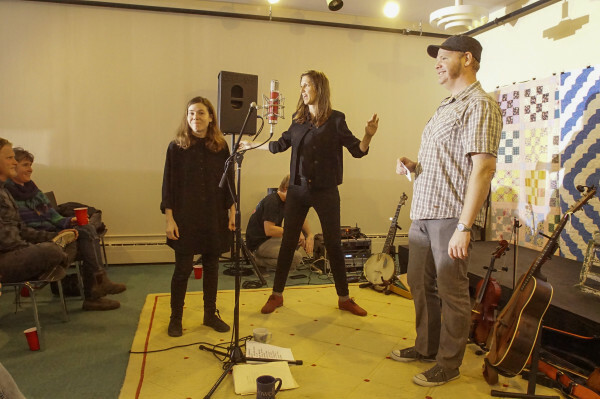 Gambrel, also a DJ at WERU-FM, wanted to bring Americana duo The Lowest Pair to Bangor. He’s a big fan. After investigating other available spaces in downtown Bangor, a mutual friend introduced Gambrel to Lance and Amy Blackstone, who’d recently purchased 58 Main St. as their new residence. The bottom two floors of their building were open space, formerly housing retail operations, and the couple was looking for unique ways to use it — especially the second floor, which can comfortably seat 90. Gambrel asked, and the Blackstones signed on to host their first house show in October 2015. Since then, Gambrel and the Blackstones have hosted shows about once per month, ranging from cellist Rushad Eggleston, who is a former member of Crooked Still, to experimental singer-songwriter The Suitcase Junket. Rather than a traditional ticket, all shows come with a suggested donation — usually between $10 and $20. Gambrel, who had no previous experience booking shows, said his method of getting artists to come to Bangor mainly consists of looking into their touring schedules, and then cold-calling them. Peer, an old hand at hosting house concerts, echoed Gambrel’s sentiments. Peer has had a long history opening up his living room to artists from Atlantic Canada — mostly in the Celtic tradition, such as Prince Edward Island musicians Richard Wood and Gordon Belsher, but also singer-songwriters and other performers. Another long-standing house show venue is the Ro-He-Ge barn in Belfast. Beginning in 2006, Dan and Amy Beckman hosted touring indie rock and psychedelic bands and artists. In 2015, Grant Corum and Suzanne Stone took over booking and moved onto the property. Gambrel said his shows attract people that not only are interested in hearing bands or artists they may never have heard before — but that are willing to pay for it. 430 Bayside will host local artists Ellacapella, Trisha Mason and Bobbi Lane at 7 p.m. Thursday, Dec. 8, with a suggested $10 donation. 58 Main St. will host songwriting duo Willy Porter and Carmen Nickerson on Thursday, Dec. 8, Nova Scotian singer-songwriter Old Man Luedecke on Jan. 14, 2017, and Los Angeles-based rock band Trapdoor Social on Tuesday, Feb. 28, 2017. Ro-He-Ge will announce shows for Spring 2017 sometime in the new year. Correction: An earlier version of this story reported that Rushad Eggleston is a former member of Old Crow Medicine Show. He is a former member of Crooked Still.